Nowadays we often hear Supply Chain Management (SCM), but still many people do not understand about SCM. I think we can make a rough conclusion about SCM. There is the word “chain” and the word “supply”. We know that chain shaped like a circle that is not broken, and the supply is a stock of goods required and can be obtained. 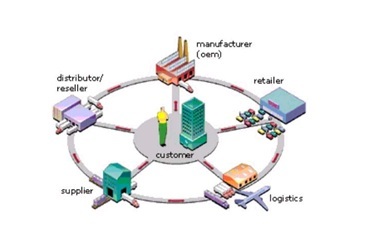 So the supply chain is an interconnected circle in order to obtain the required goods from supplier. Of course there are many factors in the loop of supply chain itself. The picture below gives us an idea about the supply chain. In order for the chain goes well of course we need to set good management. From this we know what is called Supply Chain Management (SCM). In general, SCM is a process that integrates, coordinates, and controls the movement of raw materials to make a product and deliver it to customers. Information flow includes in this process. Conscious effort is usually done to make the process can be carried out effectively and efficiently in order to maximize customers value and achieve a sustainable advantage.